Thrice were supposed to be on hiatus. Why did they return so soon? After a three-year break, Thrice are back with a new album, To Be Everywhere Is To Be Nowhere. 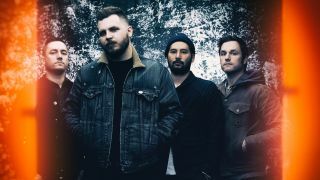 Their hiatus was prompted, in large, by frontman Dustin Kensrue becoming a worship pastor at the Mars Hill Church in Seattle. While Kensrue continued to make music on his own in that time, it was his resignation from his role there in the wake of numerous controversies, including alleged rackeetering (“Me and some other pastors had to try to make some sort of stand and call it out,” he explains) that would eventually lead to the four-piece to pick up their instruments and start writing together again. It may not have been the longest break, but it was still time for significant changes to take place, both within themselves and the world at large. Those various changes – whether small or large, personal or political – came, of course, to permeate the eleven songs of To Be Everywhere Is To Be Nowhere. It’s a record which doesn’t just confidently mark Thrice’s return to making music and the next chapter of their career, but which also serves as a brutal yet vital reflection of the unescapable truths that inspired its creation. Are you surprised the hiatus only lasted a short period of time? Let’s talk specifics about this record. The title, To Be Everywhere Is To Be Nowhere, is very philosophical – what does it specifically mean to you? Do you think there’s some kind of solution that needs to be found with regards to that idea of disconnection? Tell us about the song Whistleblower – is that about Edward Snowden revealing government secrets? The idea of hope, which I believe is something people like Snowden – and yourself – offer others by making these drastic decisions. But did you find yourself questioning your faith because of what was happening? What did that situation do to you? Okay. Because I do find – and correct me if I’m wrong – this to be quite a gloomy, pessimistic record – it starts with Hurricane, which is very portentous and doom-laden, and The Long Defeat is a very pessimistic song. Being in America especially, you’re confronted with it on an everyday basis. It’s not in a good place at the moment, and every day you see more division and more unrest. It’s kind of terrifying. Were you aware, then, that you were stepping into such political shows on this record, and what were concerns about doing so? Although Salt And Shadow takes a complete right turn and becomes lighter and more dreamy. It seems to open the door to what’s next – you’re walking out of those heavy shadows into something with perhaps more light? Would you say the time away from the band affected the dynamic? Does it feel more like a regeneration or just a continuation of where you were at when you stopped? So what are your hopes for Thrice in the future? To Be Everywhere Is To Be Nowhere is out now on Vagrant Records. For more information, visit the band’s official site.